This volume, which contains the theoretical part of Hahnemann's Chronic Diseases, has been issued at the urgent request of several Professors in Homoeopathic Medical Colleges, who wish to use it as a college text book. The basic concepts of "miasms" are discussed in this book. 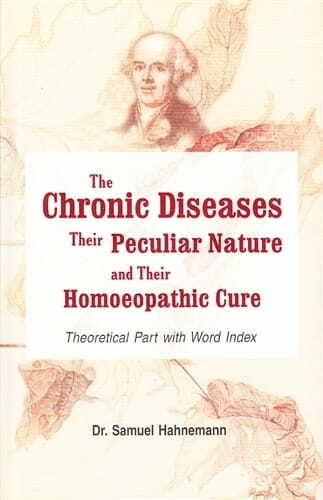 The Chronic Diseases (Theoretical Part) presently available in the market was typesetted around 100 years back. To make the book user friendly we have refurnished it. The positive changes we made are as follows: â€¢ The print size of the book has been increased from 5" x 3" to 7" x 4" which makes it more used friendly. â€¢ A new font has been used which is bigger in size and is a pleasure to read. â€¢ Footnotes which were earlier given at the bottom were difficult to find and read. In this new book, we have incorporated them in the main text at the intended places in brackets but in small fonts. This makes the reading and understanding more effortless. â€¢ Lastly but very importantly a word index of 16 pages has been added at the end of the book which makes it very easy to find the required portion of the text.